You’d think that I’d be able to answer that question with a great deal of confidence at the age of 73, nearing 74. And at one level I can. And by that I don’t mean through detailed knowledge of my ancestry. All I know already (or am likely to know in the future, for that matter) is logged on this blog either tagged as poems or autobiography. Nor am I talking about my fundamental reality as a spiritual being, something else I have explored at length elsewhere on this blog usually tagged as spirituality. No. What I am getting at is far more mundane. I read Susan Cain’s Quiet with a quiet sense of satisfaction that I had nailed all I needed to pin down in terms of my temperament. So much of what she said fitted me so well. I’ve just seen the latest Pride and Prejudice directed by Joe Wright with Keira Knightley, Donald Sutherland, Brenda Blethyn and Matthew MacFadyen. It never fails to move me as a story in a passable rendering, which this was (though not as good as Simon Langton’s with Colin Firth and Jennifer Ehle). I suspect that it is not the tough-minded observation of moeurs nor the positive resolutions that does the trick each time. It’s that Jane Austen has plumbed the very depths of unfulfilment, of unrequitable passion, of thwarted intensity. She knew what yearning was. Though she uses tales of manners satirically dressed with wicked accuracy, it is the undertow of sadness and longing that gives them power to move me so profoundly. Yes, I love her needle-sharp deflation of pomposity and hypocrisy. It makes me roar with pleasure. I admire her moral sense that probes the cracks even in the endearing Mr Bennet. But it is the pain as Elizabeth believes she is watching the man she has come to love and respect walk out of her life forever that touches my soul. Always for me it is the longing that is most real. There is some longing in me that has never been assuaged. Marriage, fatherhood, literature, religion, work and nature never do more than palliate the pain for a brief moment. There is a beauty always out of reach that my heart keens after. Most people seem not to feel it. They find effective anodynes it seems or maybe never feel this pain at all, plain and simple. I am still inventing ambitions – to think and write about spirituality and psychology for instance when I retire – to convince me that life still has some hope. But all I really see is a future of exits – valued beings and things leaving me. 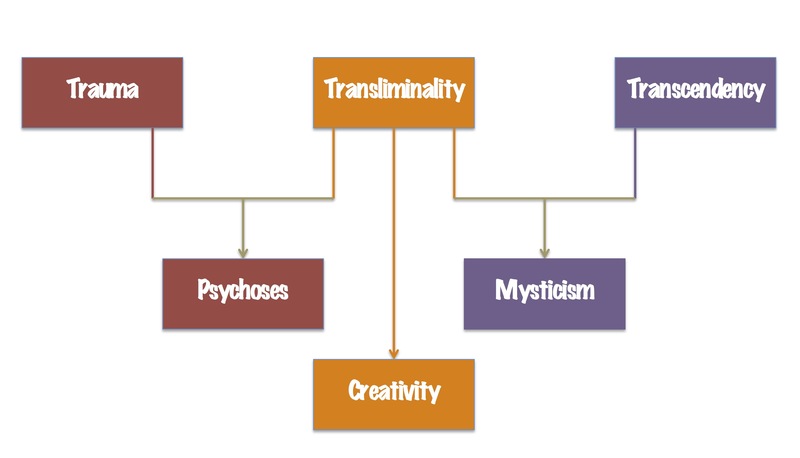 I just stumbled upon your post in looking for images on transliminality, and I think your diagram is right on. I just finished a PhD in Religion, Psychology, & Culture at Vanderbilt University and wrote my dissertation on Transliminality & Transcendence: An Exploration of the Connections among Creativity, Mystical Experience, and Psychopathology — I felt very fortunate to have found institutional support for this topic. She offered to send me a copy. I leapt at the chance. And now I come to what has triggered this recent burst of introspection. 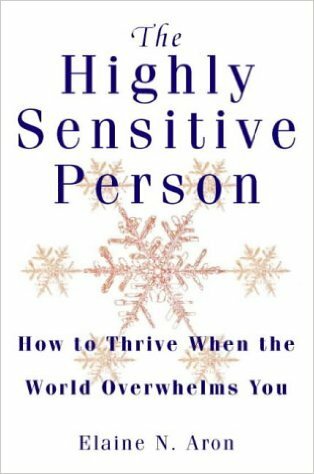 What does it mean to be an HSP, a highly sensitive person? Such persons are part of the 15-20% of (not only humans but) every animal population studied so far that is characterized by greater sensory awareness, responsiveness, and caution than the other 80-85% (Aron 1997, p. 12). Evolutionary psychologists speculate that this variation develops in all known species because its traits are advantageous in certain circumstances—like hiding from predators, or refraining from starting wars—while the majority’s less-cautious and less-reactive tendencies are better at things like adjusting to new conditions and bringing home the bacon. In people, sensory processing sensitivity (SPS) entails four qualities that can be summarized with the acronym BEDS: Behavioral inhibition, Emotional reactivity, Depth of processing, and Sensitivity to subtle stimuli (Aron et al. 2012, p. 7-11).65 Highly sensitive persons tend to hold back and inhibit their actions until they have “paused to check” out the situation at hand; their emotions are stronger or more extreme versions (both “positive” and “negative”) of what others tend to experience; they tend to, and need to, process (think about, introspect, assimilate) their experiences, feelings, relationships, thoughts, and circumstances more thoroughly than do others; they can easily become overaroused and anxious from sensory and situational stimulation that the majority of people would find comfortable; and they pick up on subtle sensory and emotional stimuli that most people do not notice. Additionally, in Aron’s initial three- to four-hour interviews with HSPs, “persons across all categories volunteered early that their particular form of spirituality (e.g., ‘seeing God in everything,’ long meditation retreats, a religious vocation) was central to their lives” (Aron et al. 2012, p. 11). What was both amusing and irritating when I read about Aron was that I immediately recollected that I had started her 1997 book on iBooks two years or more ago but had given up halfway through. My highlights and notes indicated that I had got the point that what she was saying might apply to me but had failed to register that it might matter. So, I’ve gone back to her book and finished it. I think what put me off before was partly her tone rather than the content of what she said. There was a touch too much American hyperbole for my understating English palate. There is clearly enough of an overlap between my perception of myself and the other aspects of this trait to make me suspect that sensitivity might be the missing piece in my jigsaw. Introverts can also display this trait it seems, so it doesn’t negate that aspect of my personality. What this realisation might do, after I have reflected on it for a bit longer (I can’t help myself – I must be an HSP! ), is convince me that I do not need to uncover some forgotten loss, above and beyond those I have already explored, to explain why I am prone to bursting into tears and feeling so deeply sad at times. It’s just how I am. I’m more intense than I thought was reasonable, and this is apparently not unusual for HSPs, who tend to see themselves as inadequate when they needn’t do. It also possibly explains two other disquieting tendencies I have, apart from my habit of trying to read their state of mind from the faces, postures and gestures of everyone that comes within eye-shot on the street, in cafes and just about everywhere else as well. First, I have always felt pathetic about my performance anxiety, which is also a correlate of the trait, it seems. I can remember once I was playing really well and comfortably winning a game of squash. Then I noticed that someone was watching the game from the glass window overhead and staying there, not just moving on as most people did. My game crashed and I went to a humiliating defeat. Secondly, Aron’s research indicates that ‘hunger has an especially strong effect on HSPs.’ Maybe that’s why I have always found the Bahá’í Fast so difficult. This was obvious right from the start. I had been dreading the first day of my first Bahá’í Fast – no food, no drink between sunrise and sunset in March. For someone who had never missed lunch in his life, this was a daunting prospect. I had a long two-and-a-half hour commute at that time. So, I got up at just before my usual time and prepared a bowl of porridge for myself as the most sustaining breakfast I could think of. I sat down with the porridge and a cup of tea. I had ten minutes to finish my breakfast. That was no problem as I have always been a fast eater (no paradoxical pun intended). As I sat down I felt an agonising pain in my gut and passed out. I later speculated whether it must’ve been some form of colic, probably brought on by my extreme anxiety at the prospect of the impending fast. When I came round it was too late to eat. The sun had risen. I paused and wondered what I should do. I made the wrong decision. I left my tea and porridge untouched, got ready for work and headed for the tube. To cut a long story short I spent the day with a slowly rising temperature and an increasing headache, until I ended up waiting on Guilford Station to head home to Hendon. I had a sandwich and a can of Coke in my bag. The train came, I boarded and found a seat. Still not time to break the fast! The other passengers must have found it weird to see someone peering at their watch every few seconds with a sandwich on their lap and a drink in their hand. At last the hour struck. I wrenched at the ring on the top of the can. It didn’t budge. With my hands shaking by this stage I wrenched harder. The top came off and cut me as it did so and the blood poured out. I had to fidget with a handkerchief to staunch the blood I could ill afford to spill before I was able drink my Coke. The following two days I phased myself slowly into the fast with water and salad in the middle of the day before I attempted a full day’s fasting again. Now I think I know why that is too. Time will tell whether this explanation for my well of tears, my performance anxiety, my reaction to hunger pangs, my dithering and my people-watching holds good. I hope it does. Hold on though. I may have to contact Elaine Aron to check something out. She doesn’t mention anything in her sensitivity profile about a tendency to start a book, abandon it halfway through to start another and so on ad nauseam. At present I’m halfway through at least thirteen books that I can remember, never mind the ones I’ve forgotten I started. I think she may have missed something here. I’m definitely not a Completer-Finisher and perhaps this is why. I’m too sensitive. Anyway, what were you saying about that post I said I’d write about procrastination? The next few days will see a couple of posts on train conversations. I felt that republishing this post from two years back might help set the scene. Some of my recent posts have been rather heavy going. I thought I’d lighten it up a bit for a change. 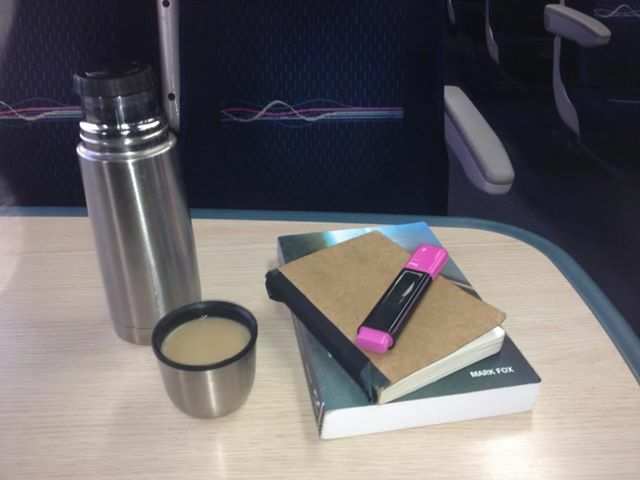 When I go by train to London for meetings, which is usually about once a month, I tend to travel in the quiet carriage. 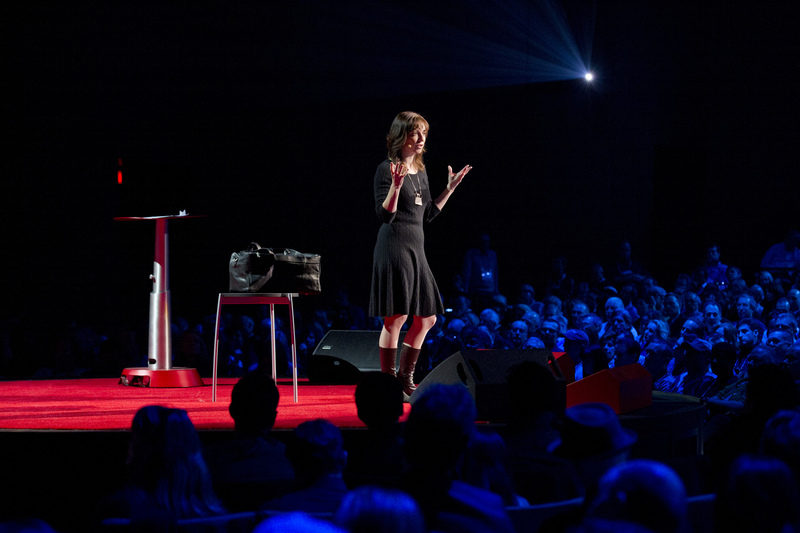 This is not just because I am a bit introverted after the fashion described by Susan Cain in her excellent book, Quiet (see her talk below), but also because I usually have a load of reading to do in preparation for the meeting. When I get on the train in Hereford, the carriage is usually fairly empty and I have a table to myself, as in the picture at the head of this post. By Worcester or soon after I usually have company. 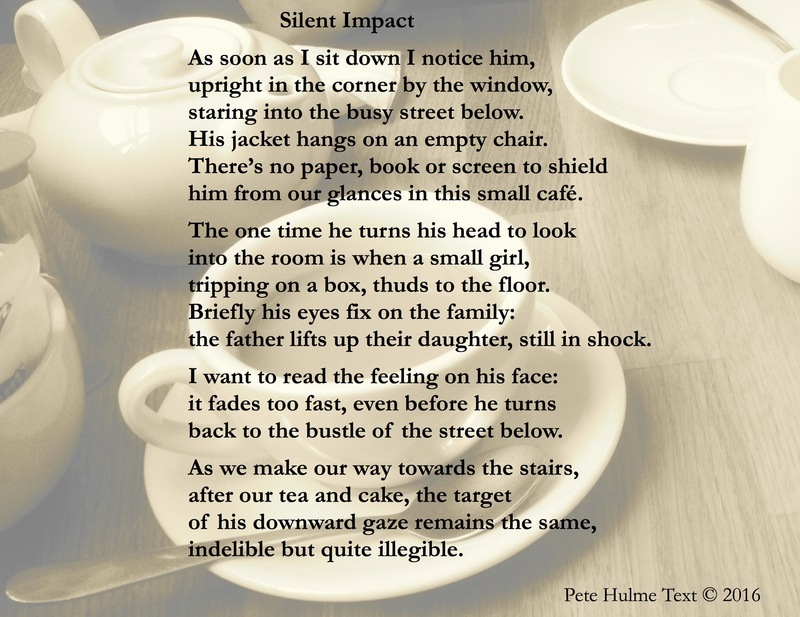 So, introvert or not, for some reason I sometimes I can’t help breaking into conversation with someone at the same table, perhaps because people like me tend to choose a quiet carriage only to discover we’ve lots in common with the person behind the book across the table. And we’re obviously not as inhibited as commuters seem to be. Talking in this way may seem to some of you an anti-social habit. It’s a quiet carriage after all. True, and I know I shouldn’t play music out loud, or have long conversations on my mobile, which I usually remember to switch to silent. However, I have never seen the quiet carriage as a kind of mobile Trappist capsule, where all talk is banned. I think he called it a ‘meeting’ because we weren’t talking about shopping or football, but about the impact of supermarkets on local trade, obviously not something he recognised as a topic suitable for conversation between acquaintances on a train. But it is exactly this kind of deeper conversation that I really enjoy and am on the watch for more or less all the time. My encounters with the chat police have rather inhibited me now from starting up such conversations on the train. Take my most recent attempt for example. On my way to London I started a conversation in a quiet carriage, even at the risk of righteous anger from somewhere uncomfortably close. The only reason I started it was because my signal went on the mobile so I couldn’t tether the laptop any longer to keep on working. ‘I’ve got no signal,’ I said to the pale man diagonally opposite me across the table, who had boarded at Evesham. He smiled in sympathy. ‘I’ll have my coffee, I think.’ I got out my flask and my chocolate bar, and started munching and slurping. ‘Are you going to London?’ I asked. He looked up from his mobile phone, obviously with a different company. ‘Which part of France?’ I spluttered through my chocolate. ‘Skiing?’ I said pointing to his absence of the essential equipment, his only luggage being the grey rucksack on the seat next to him. He gave a slight smile in acknowledgement of the observation. We slid into talking about Schumacher’s accident and he shared with me that his son had hit a hidden bump under the snow and been turned head over heels. He’d over-corrected with the result that he landed on his head at such an angle that he could have broken his neck. No harm done though as it turned out. Luckier than Schumacher. I discovered, as he tapped it to demonstrate, that snow is often as hard as the table we were sitting at, it gets so compacted by the weight of the skiers sliding over it. ‘Just one of those things,’ he said of his son’s accident. ‘Not a reason for not skiing though,’ I responded. 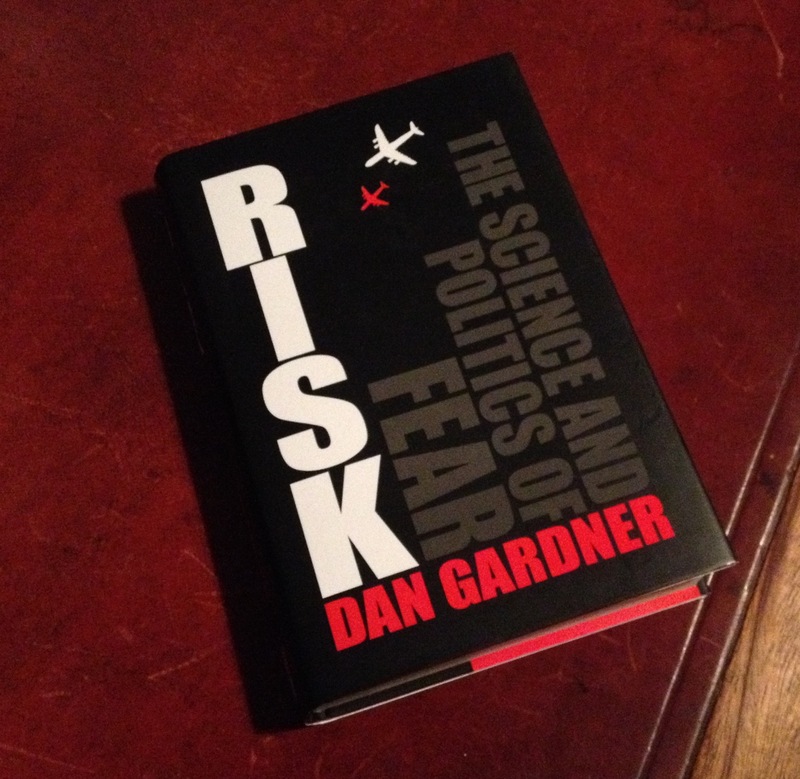 The conversation then turned to how poorly we understand risk and I gave the illustration, from Gardner’s book on the subject, of the post-9/11 reaction in America where multitudes took to the roads in preference to the air and 1,595 extra people died as a result in road accidents. We were clearly on the edge of making the conversation really interesting. He asked me to watch over his things as he went to the restaurant car for a coffee. ‘I’ve obviously triggered something,’ I joked pointing to my flask. He laughed. I caught the withering glance of the woman opposite. ‘I forgot we were in a quiet carriage,’ I whispered. We shut up after that. I didn’t have the nerve to re-start a conversation as I’d heard the shrill voice of a vigilante ticking off a family who had boarded at Oxford for making too much noise. I was remembering the excited four-way conversation I’d had with the three young professionals when I was coming to a Chaplaincy meeting a few weeks earlier. What triggered us into our deep exchange of ideas was that all bar one of us had a connection with St Thomas’s Hospital where I was heading for the meeting. Mine was obvious and fairly meaningless, the woman had been born there (how likely was that?) and one of the men had been trained there – still a pretty improbable connection and even more so when you put it with the others. Not sure what Gardner would’ve made of all that but Kahneman would have had a field day quoting baseline probabilities. It was enough to get us going about the meaning of such things, anyway. We were in full flow when we had been interrupted by someone behind my head shouting at us with a typical rebuke. We had continued in whispers because the conversation had simply been too interesting to stop – coincidence, synchronicity, NDEs, theodicy, evolution. No way we could shut up about that kind of thing. Perhaps I have to accept that cafes are better places to hold this kind of exploration. The week before last was a good example. I met up with two former colleagues in a local coffee shop. We covered a lot of ground – psychopaths, psychotherapy, NDEs (again!) and planned obsolescence to quote the ones I can remember. The only downside was the over enthusiastic proprietor. We had admittedly placed rather a frugal order of two soups, two coffees and a fruit juice between the three of us to justify unlimited chatting time. But he was more than half empty and he was a bit trying. Just as one of us was launching into a fascinating point, up he would pop. ‘Are you sure you don’t want a piece of cake. We’ve a delicious selection,’ he’d offer brightly. And again the bad penny. From his point of view, of course, it was quite logical. Our unnoticed coffees had got colder as the conversation had warmed up, and our bowls of soup were empty. Why wouldn’t we want a top up? He was assuming we had gone there to eat after all, whereas really we were there, three introverts in their element, to talk about really serious things. Eventually, it became obvious that our welcome was hugely overstretched. We headed for the exit. Even as we queued to pay, each of us separately, the conversation carried on apace. ‘How much? Can I pay by card? And there was this study done, this other programme said, that showed that 1% of people don’t mind killing because they are almost certainly psychopaths . . . £4.50 is it? OK . . . and the army definitely doesn’t want them in its ranks – too unpredictable . . . Yes, I’m putting my pin number in now . . . . there’s another 1% of completely ordinary people who don’t mind killing either. The army has a heck of a job to induce the other 98% to kill anybody. Thank you for a nice meal. Whoops, my card, nearly forgot. So, in quiet carriages they don’t want you to talk because you disturb other people, and in cafes they don’t want you to talk too much because you can’t talk and eat at the same time. I have a serious problem here and I’m working on it. Not everyone wants to sit at home and talk. No one wants to pay money just to sit at a table so they can talk. And going to a park in winter is not an option. I’ll let you know if I find the solution. Recommended Link: Introverts and Introversion – What does it feel like to be an introvert? It’s a while since I wrote about introversion. I’ve included below the Susan Cain video which I enjoyed watching at the time. It’s good that so many other people have picked up the baton very ably instead – so many in fact that I haven’t read to the end of the piece yet. Below is an extract. For the full post see link. How does it feel? I feel frustrated for always having to apologize to people for wanting to take time to myself on occasion or feeling awkward defending my need for alone time. I’m tired of trying to convince others that I’m normal and that introversion is widely misunderstood – even among those who call themselves introverts! I’m an introvert, that how I am, and I’m fine with it. And I shouldn’t have to apologize. I’ve spent a fair amount of time thinking about this, especially in the last year an a half. I’m a very strong introvert who’s attending business school, which is one of the most socially active environments I’ve ever experienced. The term “introvert” has an unnecessarily bad reputation, for reasons I don’t entirely understand, and would like to address a few misconceptions. My thoughts below are of course generalizations, and come with the same risks that any kind of generalization bears. Let’s first ground ourselves in what it means to be an introvert. In short, we reenergize by being alone. As copied from Wikipedia: some popular writers have characterized introverts as people whose energy tends to expand through reflection and dwindle during interaction. This is a common misconception of introverts. We’re thought of as the social outcasts. We’re taught as kids that we’re supposed to go make friends with the other kids playing in the sandbox. And if we don’t, we’re weird and our parents have to apologize to the other parents for our behavior. We have to relearn what introvert really means. Introverts can be perfectly social and most are. We have many friends, are quite well adjusted, and fit a broad range of societal definitions of normal. Its just that when everyone else is running out for the 5th consecutive night out at a bar, we’d prefer to take a night to ourselves on occasion. Towards the end of the previous post of this pair, drawing from Susan Cain’s fascinating book, Quiet, we touched on something that can impact on close relationships between extraverts and introverts. This was the idea of a Free Trait Contract, where, for example, the extravert who wants to have a big dinner party every Saturday compromises with his introverted spouse and goes for every other week instead and allows her to have quiet conversations on the sidelines rather than have to stand centre stage as he does. She has given ground as well by agreeing to the fortnightly parties. This was a painfully common dynamic in the introvert-extrovert couples I interviewed: the introverts desperately craving downtime and understanding from their partners, the extroverts longing for company, and resentful that others seemed to benefit from their partners’ “best” selves. Just as men and women often have different ways of resolving conflict, so do introverts and extroverts; studies suggest that the former tend to be conflict-avoiders, while the latter are “confrontive copers,” at ease with an up-front, even argumentative style of disagreement. When Emily lowers her voice and flattens her affect during fights with Greg, she thinks she’s being respectful by taking the trouble not to let her negative emotions show. But Greg thinks she’s checking out or, worse, that she doesn’t give a damn. Similarly, when Greg lets his anger fly, he assumes that Emily feels, as he does, that this is a healthy and honest expression of their deeply committed relationship. But to Emily, it’s as if Greg has suddenly turned on her. “Many people, like the swami’s cobra, confuse the hiss with the bite,” writes Tavris. . . . . [b]oth have much to learn from the swami’s story: Greg to stop biting, Emily that it’s OK for him—and for her—to hiss. This undoubtedly works, but both sides have to vigilant otherwise the introvert hiss becomes inaudible and the extravert hiss becomes ear-piercing. I hope these posts have given a flavour of how useful and intriguing Susan Cain’s exploration of introversion is. Given that the success or failure of a society, a marriage or a family depends to a large extent upon the effectiveness of its communication, there is much of value to be learned from this book. Our communities have to find a place for both temperaments. Her references to the studies of the 2008 recession give a powerful example of exactly why. Disdain for FUD—and for the type of person who tends to experience it—is what helped cause the crash, says Boykin Curry, a managing director of the investment firm Eagle Capital . . . .
“Each time someone at the table pressed for more leverage and more risk, the next few years proved them ‘right.’ These people were emboldened, they were promoted and they gained control of ever more capital. Meanwhile, anyone in power who hesitated, who argued for caution, was proved ‘wrong’. The cautious types were increasingly intimidated, passed over for promotion. They lost their hold on capital. This happened every day in almost every financial institution, over and over, until we ended up with a very specific kind of person running things.”. . . Stand by then for the quiet revolution! For a long time, during my rewarding years as a psychologist working with and fascinated by people, something which ran alongside an active engagement with the Bahá’í community, I puzzled over how all that could be reconciled with a highly introverted temperament. Susan Cain’s inspiring book, Quiet, gives a fascinating insight into the dynamics of introversion and dispels many of the myths attached to that label. Her book covers a huge amount of ground and it would be impossible to do justice to its complexity in a couple of blog posts. 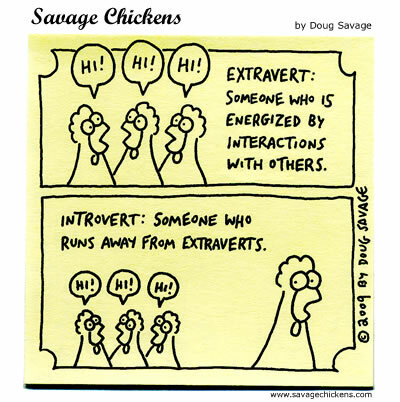 So, I’ve chosen just two aspects to look at in more detail: Free Trait Theory and Introvert/Extravert partnerships. The first of those is one of the most important in her book, at least for anyone who wants to combine introversion with social effectiveness. It helps resolve the puzzle that perplexed me for so long. She discusses the extent to which we are prisoners of our temperament. This thread runs through the whole book but there is a particularly telling section towards the end. It concerns this concept of Free Trait Theory. What she means by that will become clear as we go on. There is a sense in which this could fairly be seen to involve some degree of forcing oneself against the grain. This doesn’t mean that a socially active introvert is some kind of hypocrite.
. . . we are only pretending to be extroverts, and yes, such inauthenticity can be morally ambiguous (not to mention exhausting), but if it’s in the service of love or a professional calling, then we’re doing just as Shakespeare advised. She goes on to state that ‘self-monitors are highly skilled at modifying their behaviour to the demands of a situation.’ There are those who feel that this is somehow deceptive (page 214). This may be more than a touch unfair as the motivation for reading and responding smoothly to the social cues may not be to look good or to gain a personal advantage, but to avoid a faux pas and to be more effective at achieving objectives that are not self-serving but socially useful and helpful to others. I have found that there are three key steps to identifying your own core personal projects. . . . . First, think back to what you loved to do when you were a child. How did you answer the question of what you wanted to be when you grew up? The specific answer you gave may have been off the mark, but the underlying impulse was not. . . . . Second, pay attention to the work you gravitate to. . . . . Finally, pay attention to what you envy. This last one might seem a bit puzzling. What she means is watch out for those people whom you envy for engaging in an activity you long to do yourself.
. . . . . the best way to act out of character is to stay as true to yourself as you possibly can—starting by creating as many “restorative niches” as possible in your daily life.
. . . . . calls, with great passion, for each of us to enter into “a Free Trait Agreement.” . . . . It’s a Free Trait Agreement when a wife who wants to go out every Saturday night and a husband who wants to relax by the fire work out a schedule: half the time we’ll go out, and half the time we’ll stay home. Double pneumonia and an overscheduled life can happen to anyone, of course, but for Little, it was the result of acting out of character for too long and without enough restorative niches. . . . . When your conscientiousness impels you to take on more than you can handle, you begin to lose interest, even in tasks that normally engage you. And this brings us neatly to the point where we need to deal with introvert/extravert relationships – the topic for the next post. Whatever the underlying cause, there’s a host of evidence that introverts are more sensitive than extroverts to various kinds of stimulation, from coffee to a loud bang to the dull roar of a networking event . . . . 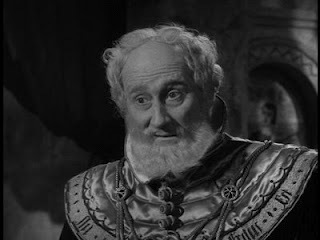 I have just returned from an exacting test of temperament. Mumbai and introversion are not a good mix. For me, I think the city would come close to number one in the top ten of worst destinations for an introvert like me to visit especially when it is getting so hot (36 degrees C). There is an unsettling frenzy about the place. 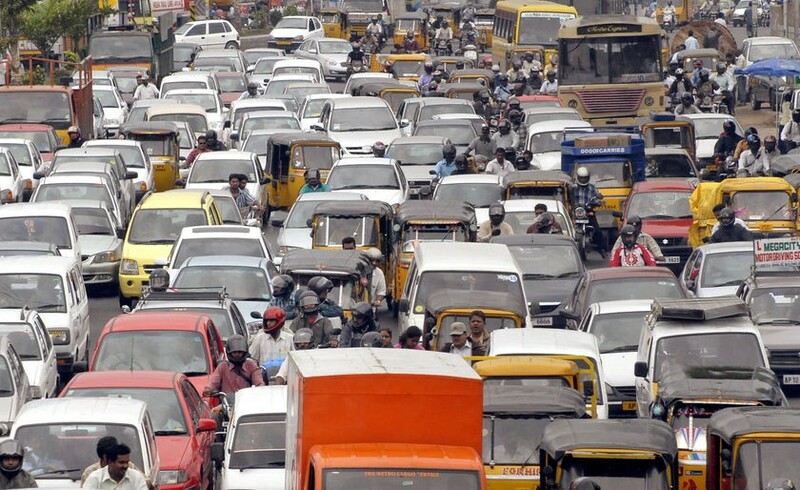 To say its traffic roars would be an outrageous understatement. Three wheeler motorised rickshaws, pushbikes, taxis, motorbikes, cars and the occasional hand-drawn cart jostle with hands constantly on horns for ever so slight advantages through nerve-shreddingly narrow gaps on bumpy and broken roads that run alongside ramshackle huts and makeshift markets that spill into their edges. This ‘can’t wait’ mentality spawns and reinforces much of the endemic and extreme corruption as well the permanent cacophonous collective death wish of the streets, I think. For various reasons we were stuck in Mumbai the whole time, something that hadn’t happened in any of my previous trips to India. I love the mountain district near Pune for example. 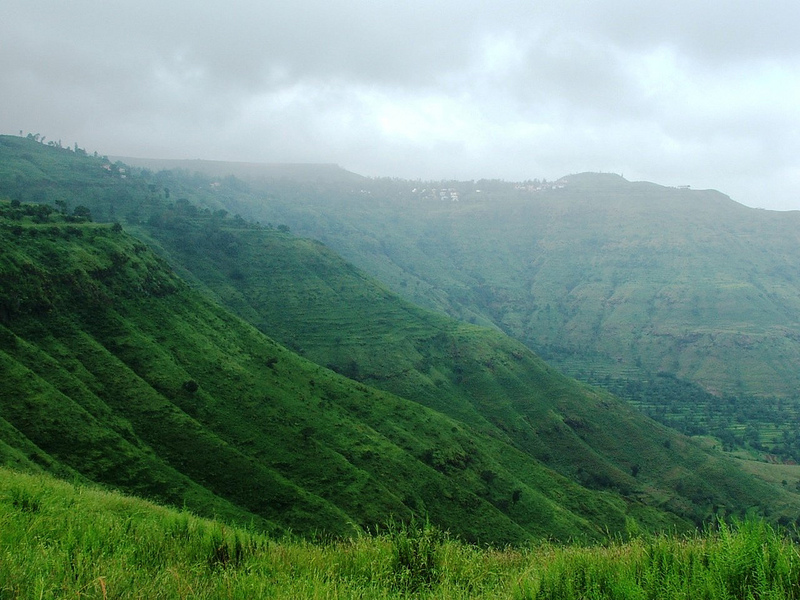 We have often gone to Panchgani in the past where there is silence, greenery and open spaces for refreshing walks and time to simply ‘be’ with people and with nature. I don’t think I quite realised how discordant I would find fifteen days in the heart of Mumbai’s mania. A thread that was woven into this pattern highlighted for me how far I have still to go on my spiritual path. I had taken with me, along with Susan Cain’s brilliant Quiet, Earl Redman’s moving and inspiring book ‘Abdu’l-Bahá in Their Midst. At a similar age to me exactly one hundred years ago, once He was given his freedom to travel, ‘Abdu’l-Bahá undertook a gruelling three and a half year journey from what is present day Israel through Egypt to England then to North America and back again, including Scotland in his itinerary. He travelled over vast distances the length and breadth of the United States, often on the hard seats of third class carriages rather than in a sleeper. He spoke tirelessly to innumerable gatherings of widely divergent people and patiently received an incessant stream of visitors in his rooms. The extreme contrast between the Eastern environment from which He came and the Western one through which he tirelessly travelled could not possibly have been greater. His feats of uncomplaining endurance contrasted starkly with my own lack of stamina. To recognise that difference is not a reason not to strive to do more but needs to mitigate our inevitable disappointment when we fail to emulate the perfect Example of ‘Abdu’l-Bahá. 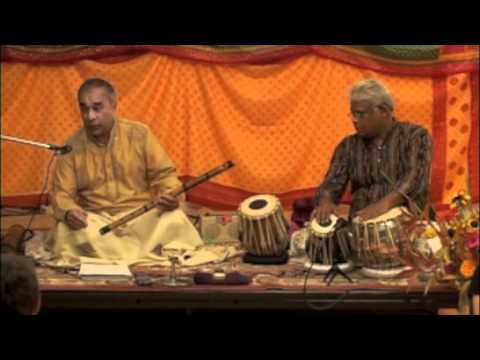 There were moments when I wondered how long it would take for the frenzied impatience I was experiencing around me in Mumbai to be replaced by the peaceful compassion I was reading about and which can be found beautifully exemplified in India itself in the stillness of yoga, the quiet rapture of Buddhist meditation and the timeless rhythms of the ragas. I suppose, in the end, that depends upon us and how much effort we are prepared to make.